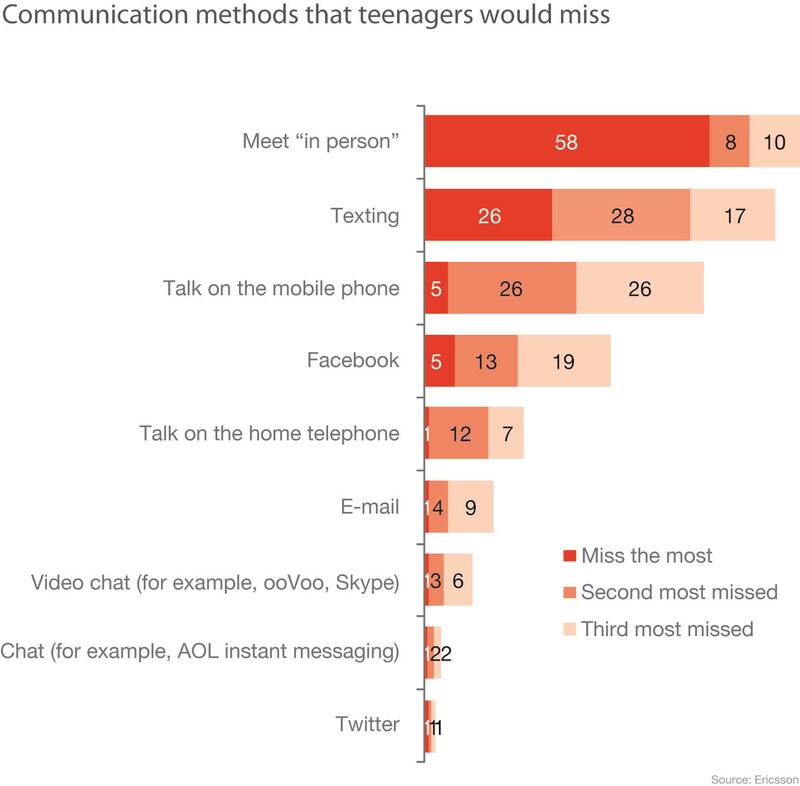 How do teenagers prefer to communicate and socialize with each other? 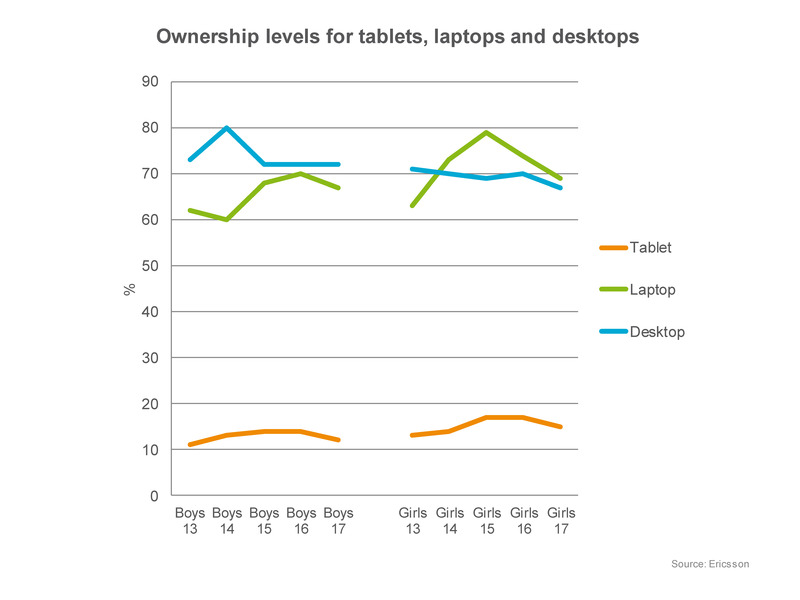 At Ericsson (NASDAQ:ERIC), we think their behavior has important implications for the future of devices and technology. Between June and November 2011, Ericsson ConsumerLab carried out research into what those implications will be. "Behaviors are dynamic, and shift as people enter different life stages. As they get older, teenagers start to use communication tools in the same way as adults. 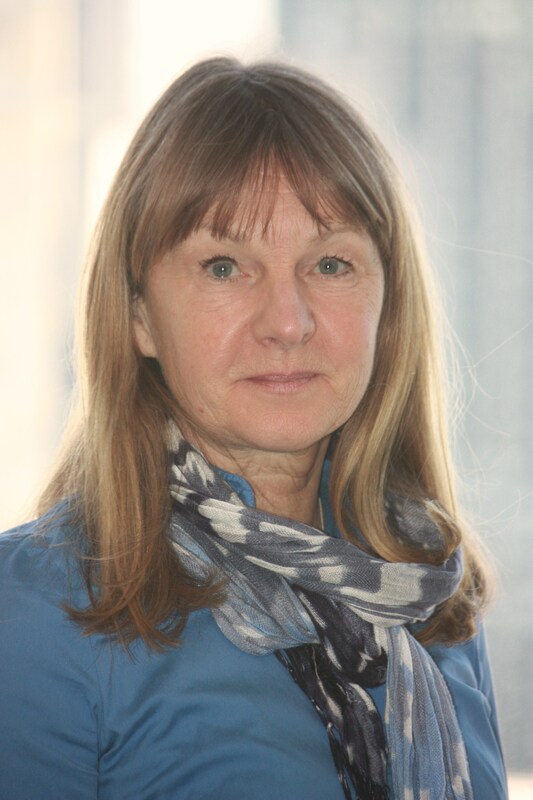 They will continue to use 'their' tools such as texting, Facebook and video chat, but at the same time, they understand the need to use voice and e-mail as they move into the next stage of their lives," said Ann-Charlotte Kornblad, Senior advisor at Ericsson ConsumerLab. 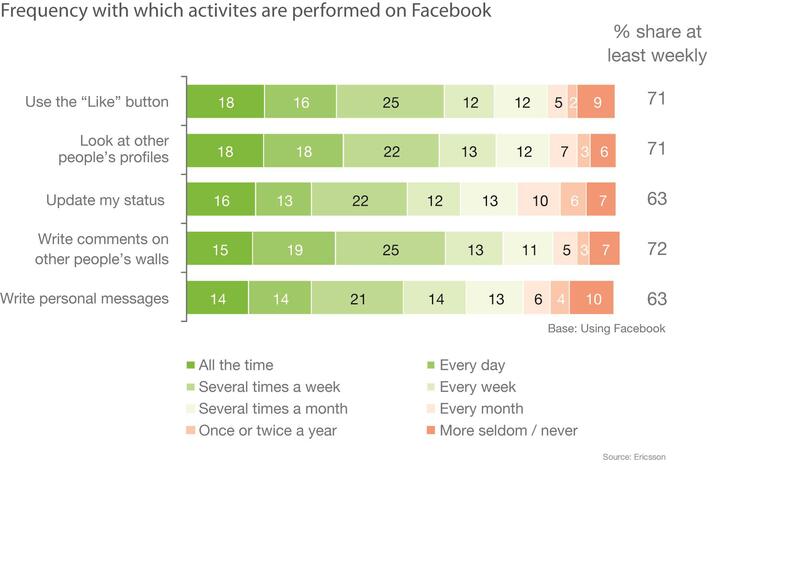 The survey shows that the common usage of texting and Facebook has changed the dynamics of teenage dating. The biggest changes can be seen in the courting process, where the goal is to ask the other person out on a date. However teenagers still meet potential romantic partners face-to-face. 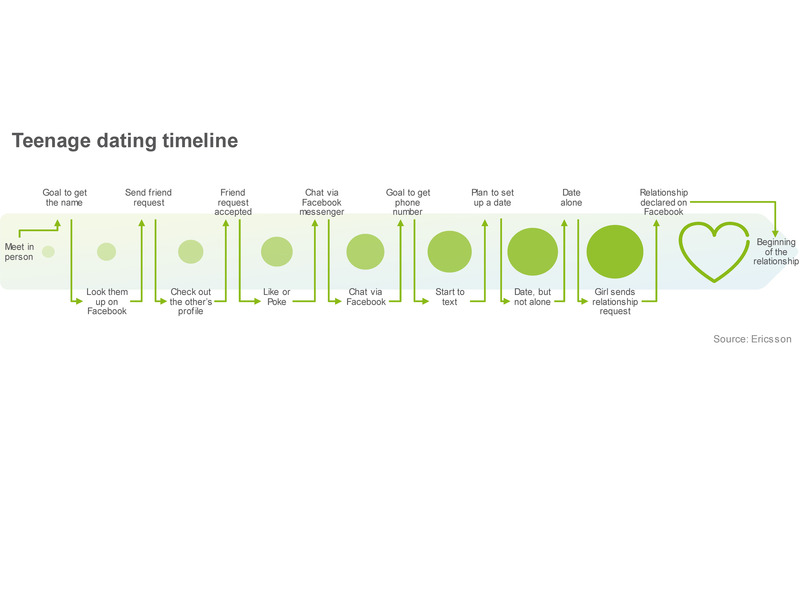 Another clear shift is the fact that changing your Facebook relationship status to "in a relationship" or "single" is now seen by friends as the official declaration. Texting remains the teenager's tool of choice when face time isn't an option. It is a tool that does not interrupt the flow of their lives. Voice calls, on the other hand, are considered by teenagers to be more suitable for adults. 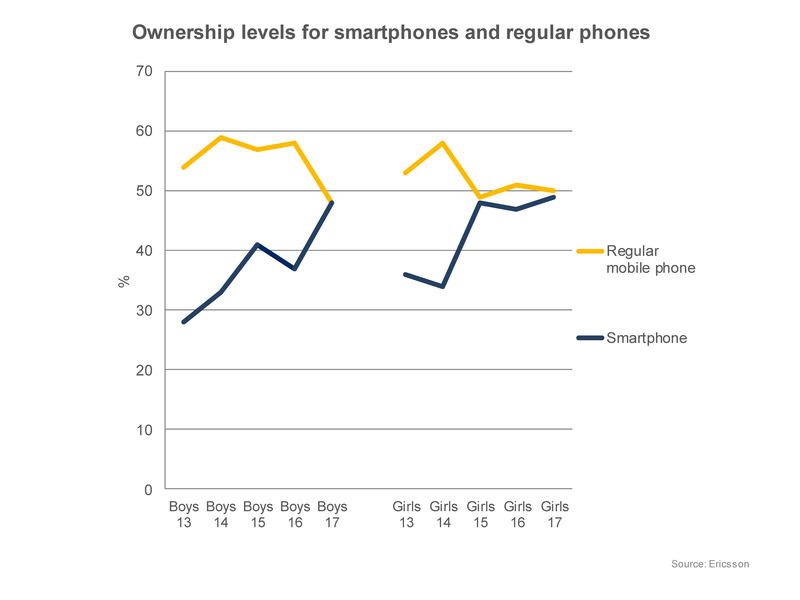 The report finds that the ownership level for smartphones and regular mobile phones are the same for 17-year-olds, but 13-year-olds are much more interested in getting a smartphone, if they don't already have one. The study consisted of almost 2,000 respondents and involved a representative sample of 20 million people between 13 and 17 years of age, representative of the entire US. The behavior reported is similar to that in many other countries. The study also consisted of 44 qualitative interviews. Ericsson ConsumerLab is a knowledge-based organization that provides consumer insight to influence strategy, marketing and product management within the Ericsson Group. Ericsson ConsumerLab has more than 15 years' experience in consumer research, which involves studying people's values and behaviors, including the way they act and think about ICT products and services. This knowledge helps operators develop attractive revenue-generating services.